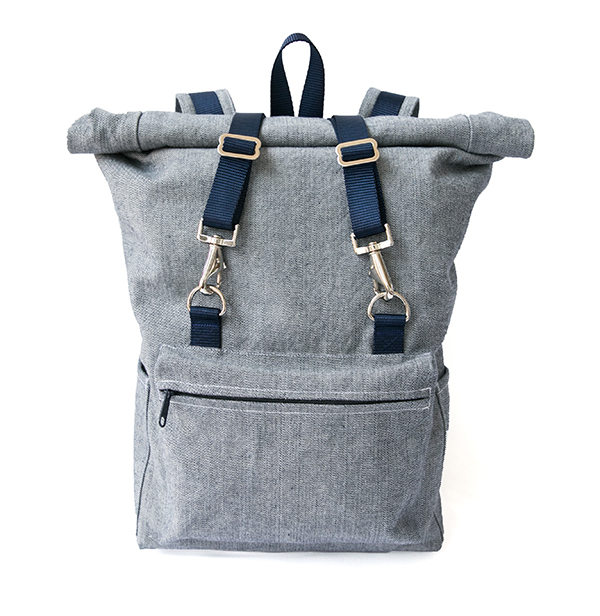 Sewing world, meet The Desmond roll top backpack! It’s finally here and I am beyond thrilled to be releasing my first pattern! The pattern is currently available as a PDF download in my shop. The Desmond backpack is perfect for your next adventure, whether that be a weekend getaway, trip to the market, or commute to the office. It’s big enough for all of your essentials, but small enough to use as an airplane carry-on, easily fitting in under seat storage as well as in overhead bin space. A simplified design features a roll top closure, zipper pocket on the front for smaller items, and two slip pockets on the sides. 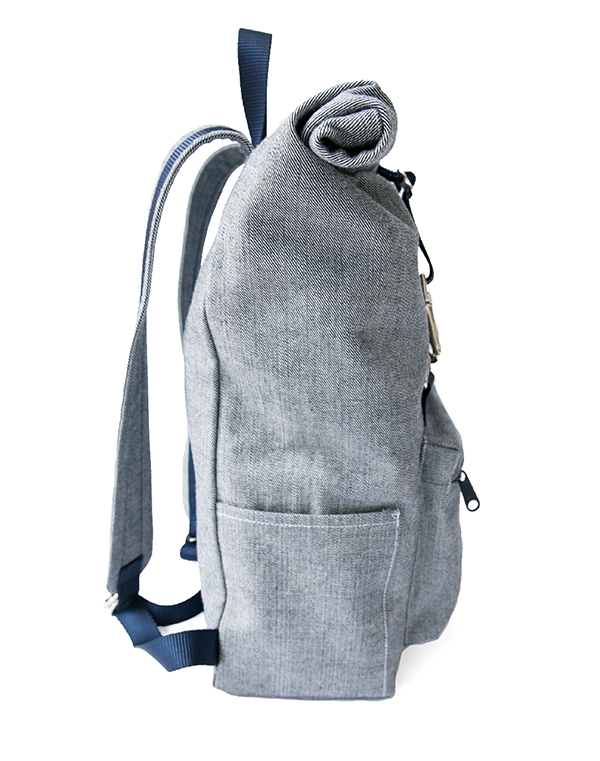 The pack is fully lined with additional open top pockets on the inside. Finished pack dimensions: 16.5″ tall, 11.5″ wide, 5″ deep. The shoulder straps are adjustable using a set of O-Rings, but other strap adjusting hardware can be substituted depending on preference. Fabric and hardware requirements can be seen here. In addition to the pattern, I am also selling kits that contain all of the necessary hardware to make the pack except for fabric and thread. There are two versions of the kit, one with webbing and zipper included, and one with just the hardware if you want to choose your own zipper and webbing colors. I used the reverse side of 13.5oz Cone Mills denim for this pack, which I happen to love with navy webbing and zipper. As awesome as it looks, the thick fabric proved to be a bit tricky to work with in thick areas. Use your best judgement depending on how your machine handles thick fabrics. You can certainly use a lighter weight denim for a similar look that might be easier to work with. Skill level for the pattern is intermediate. This is an unstructured pack (no frame or padding), so it’s not the kind of pack you would use for lots of heavy books, a jungle trek, or mountaineering with heavy loads. It is, however, perfect for use as an every day bag. Starting a week from today, October 8th, I will be hosting a sew-along with step-by-step instructions for anyone who wants to follow along and make their own Desmond roll top pack. 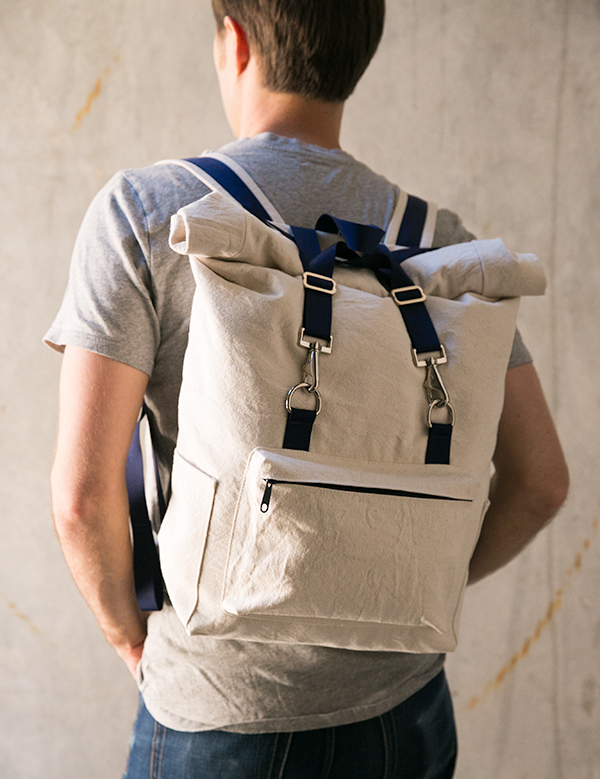 Here is the backpack in natural canvas. A look at the inside of the pack. 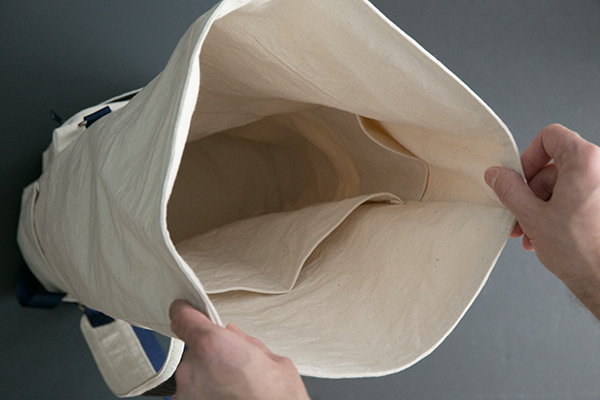 The lining has several open top pockets to keep smaller items organized. This is my first jump into the pattern world, and I am always open to suggestions on how to make things better. 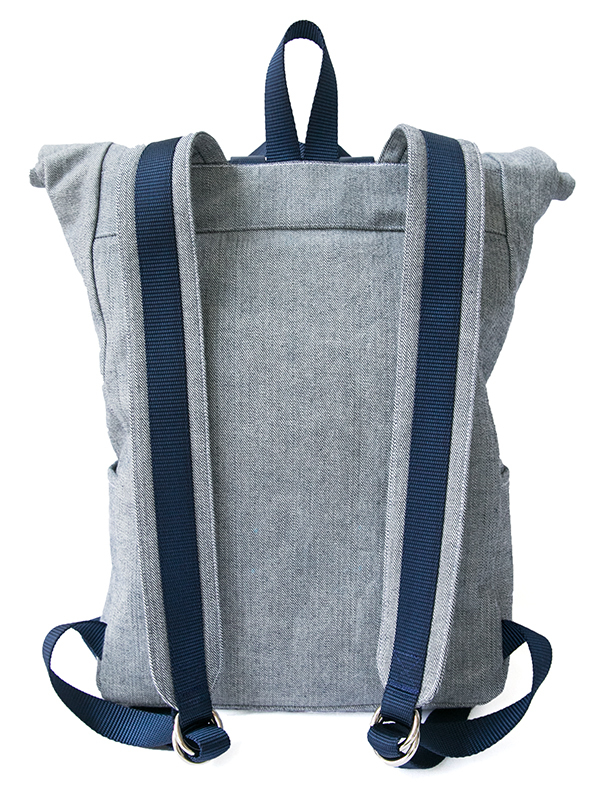 Please feel free to get in touch if you have any questions about the pattern, or if I can help in any way as you cut and sew your own Desmond backpack. 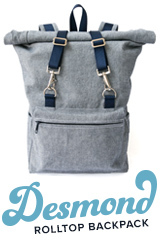 Get your Desmond backpack pattern in the Supply Shop!!! Excellent bag, been waiting excitedly for the release, congratulations! Purchasing as soon as I get home. I’m so happy for you! And of course for everyone else who now gets to sew their own pack 😉 I keep thinking about one in black denim… so I particularly like your denim version shown here. also, to use the reverse side is genius! Awesome! Let me know if you have any questions about it. Thanks again for all of your help testing the pattern! I think black denim would look fantastic. This is gorgeous! Love love love it! I’ve steered away from sewing bags, but I’m tempted to give this a try! Did you pre wash the denim ? I brought some very nice denim back with me from Japan, and I’m wondering if the blue would rub off on things in the backpack if I reversed it like you? I was also worried about the blue rubbing off, so I washed the denim 2 or 3 times before sewing. The pack is fully lined, so the lining should guard against most color transfer, but if it ever got wet, then there is the potential for the blue to bleed a little bit. You could also use a somewhat dark lining so the blue would never show though if it did bleed a little. What a great bag! I’ve been trying to figure a way to do some more unselfish sewing for gifts and the like. Your backpack will be perf. This backpack is so awesome! It definitely fulfills a much-neglected niche in the sewing pattern world. I plan to make one for my husband and another for myself! That bag looks amazing! Just wonderful. I might make it!